Edmund Barnes is the eighth child of Edmund (1773-1844) and Margaret (1776-1846) Barns. 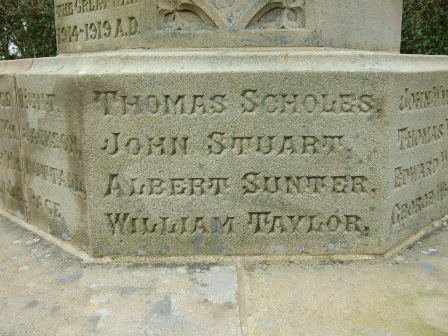 He was born in Tockholes in 1816 but was baptised at St James, Darwen, on 26th May 1816. 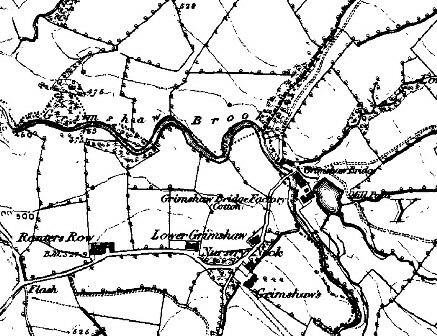 The family moved to Tockholes just before their daughter, Betty, was born in 1812. Betty is the only child that was not baptised at St James, she was baptised at St Stephens, Tockholes. Margaret came next in 1814, then Edmund in 1816. 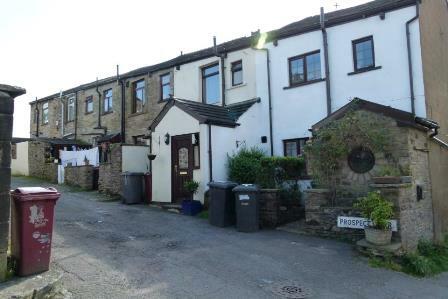 I'm not sure when the family moved to Eccleshill but they were living there by the 1841 census. I am guessing they probably moved to Eccleshill fairly soon after Edmund was born and that this probably accounts for the census records saying he was born in Eccleshill. with his parents, Edmund who is 68, and Margaret who is 65, as well as his siblings, Alice, aged 30, and her two children, Martha and James; his elder brother John, aged 25, and an Andrew who is 15. 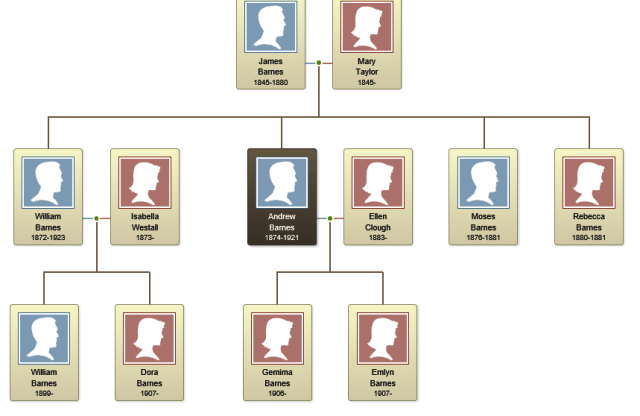 I suspect Andrew could well be the illegitimate son of Alice, partly because her other two children, Martha and James are also illegitimate but also because Margaret would have been too old at 50 to have given birth to him. But, of course, the ages are all confused so this could be a wrong assumption. On 25th June 1843 Edmund marries Ann Duckworth, who comes from Belthorn, at St Mary the Virgin, Blackburn; actually, the marriage records say both Edmund and Ann come from Pickup Bank; I am assuming this is the ecclesiastic area. They go on to have at least 7 children: Margaret 1844-1914; James 1845-1880; Betty 1848-1911; Nancy 1852-1877; Mary 1854-1915; Andrew 1857-1915; and Alice 1859. I had great trouble finding Edmund and his family in the 1851 then I discovered why, he is down as Edward Banes. But I feel certain the record is correct because although his wife is down as Sam (it should be Ann), the three children are there, Margaret aged 7, James 5 and Betty 2. Ann is down as being 25 and Edmund 28. It is hard to read where they live but it looks like near Black Dog - it seems there were 11 beer houses at one point in Belthorn! 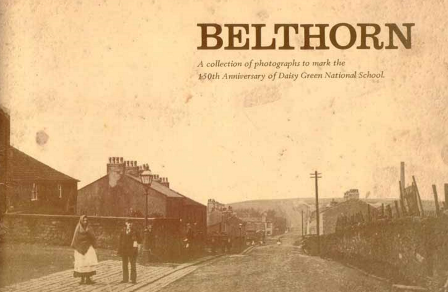 The family stay in Belthorn. Some of the boys work down the coal mine whilst the girls work in the cotton mills. Here is a link to the above booklet: it is highly likely that members of the Barnes family are in some of the photographs. Edmund dies in 1891 aged about 73. 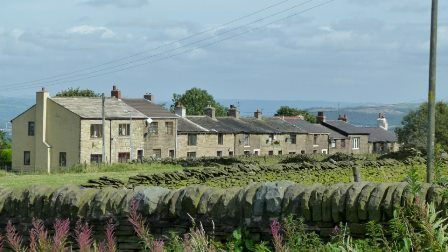 In 1891 his wife, Ann, aged 70 is living at 10 Belthorn and Ned Row with their daughters Margaret 49 and Alice 32, both are single and cotton weavers; next door but one lives her son and his family, Andrew. Ann dies in 1899. Margaret dies in 1914 at the age of 70. 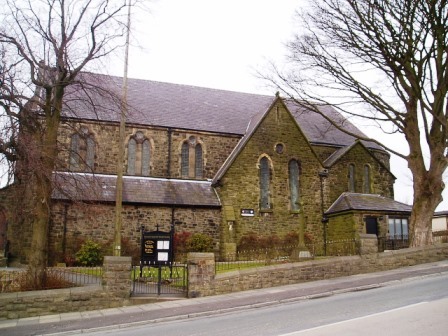 James marries Mary Taylor on 26th November 1870 at Immanuel Church, Oswaldtwistle. 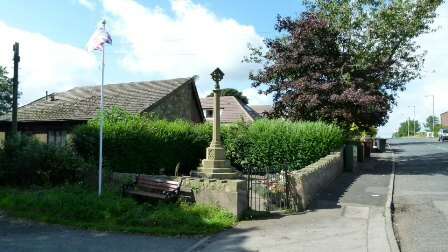 James dies in Belthorn in 1880. In 1881 his sons William and Andrew are boarding with relations Nancy Eccles and her husband Richard at 345 Accrington Road, Blackburn. Sadly, Mary like James, wasn't meant to live very long: she dies in 1885 and is buried on 13th October at Immanuel Church. Her grave is 74 ft from West Wall, 63 ft from Old South Wall. 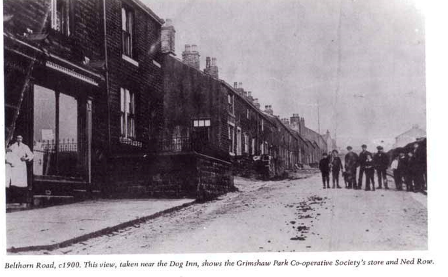 In 1901 they are living at 235 Accrington Road, Blackburn. William is a coal miner and Isabella a cotton weaver; they have a two month old son, William. 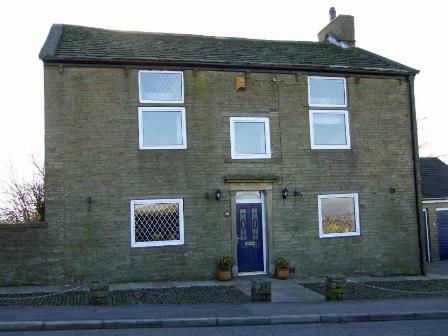 By 1911 they have moved to 18 Fecitt Brow. William, 12, is now a cotton weaver and Dora, their second child, is 4. Both children were born in Blackburn. William dies on 8th September 1923 at 8 Eagle Street, Blackburn. He leaves Â£473 14s 3d to his wife, Isabella and his son William who is a motorman. Andrew marries Ellen Clough at All Saints, Clayton-le-Moors in 1902. In 1911 they are living at 2 Railway Street, Church. Andrew is 34 and a labourer at a coal mine; Ellen is 28 and a card room hand. Their children, Gemima, 5, and Evelyn 4, are there. 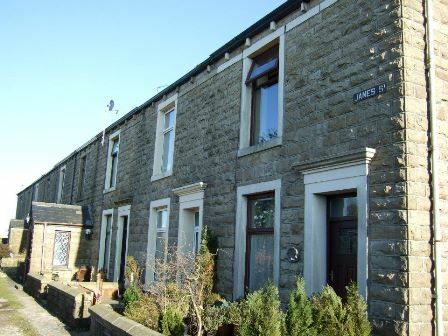 Their first child, Mary Ann, is living with her grandma, aunt, uncle and cousins at 27 Fielding Terrace, Altham. Andrew dies in 1921 in Oswaldtwistle. 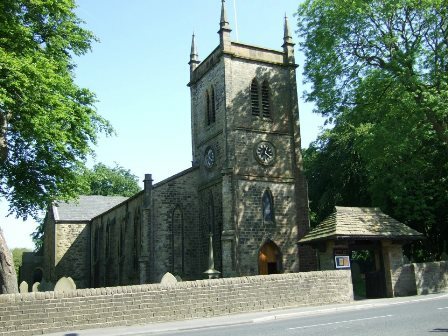 His daughter Mary Ann marries Joel Hardy at All Saints, Clayton-le-Moors on 23rd September 1922; she dies in Blackburn at 79 years of age in June 1983. Gemima marries William Entwistle at St James in Church in 1925; she dies at the age of 79 in December 1984. Evelyn doesn't marry; she dies when she is 49 in 1956 at Clayton-le-Moors. 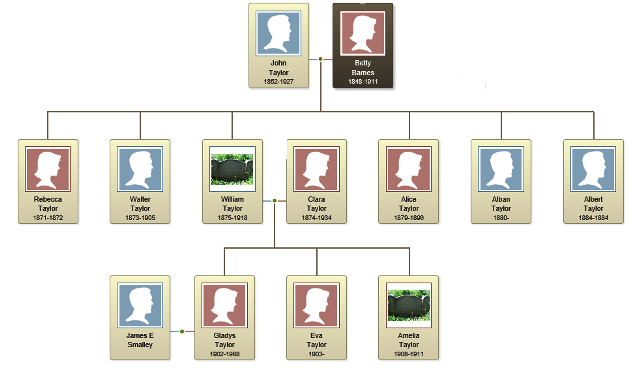 Betty marries John Taylor in 1871; they have seven children: Rebecca (1871-1872); Walter (1873-1905); William (1875-1918); Alice 1879-1896; Alban (1880-1880); and Albert (1884-1884). I have not been able to trace the seventh child. 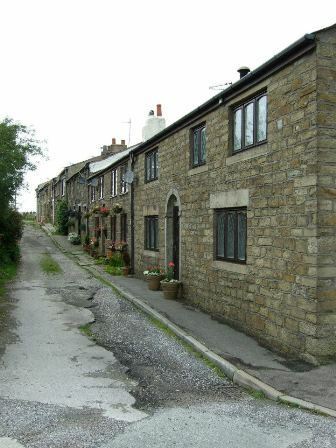 Betty lives in Belthorn all of her life; the 1891 census tells us she is living at 2 Chapel Street with her husband, John who is 39 and a coal miner. Her son Walter is 17 and William 15, both are cotton weavers; her daughter Alice is 12. At least three of her children have already died in infancy, Rebecca (1871-1872), Alban (1880-1880), Albert (1884-1884) and probably a fourth. But more tragedy has to come: her daughter Alice dies on 10th March 1896, she is 17 years old. 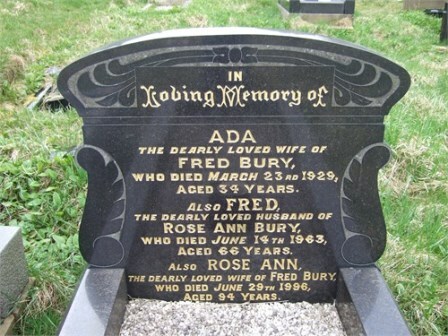 She was buried on 14th March at the Independent Chapel in grave number 72. 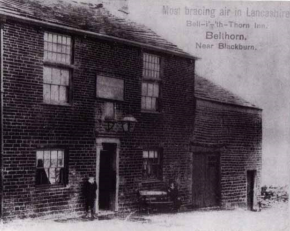 In 1901 John is a publican at the Bell in the Thorn. He is 49 whilst Betty is 53. Walter is 27 and a labourer in a coal pit. Also living with the family is Annie Davies who is 10 years old and is said to be John's daughter-in-law; clearly this cannot be the case. 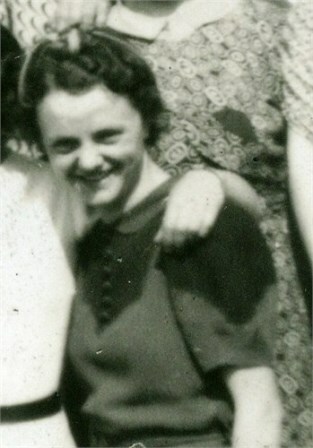 Betty's aunt, Margaret Barnes, aged 57 and a cotton weaver, is also living with the family. Hopefully she is able to give the family some support. Sadly, tragedy is just around the corner again as Walter dies in 1905 at the age of 32. So many deaths in one family. Betty herself dies on 15th February 1911, aged 63, having seen six of her children die young; she must have been absolutely heart-broken. 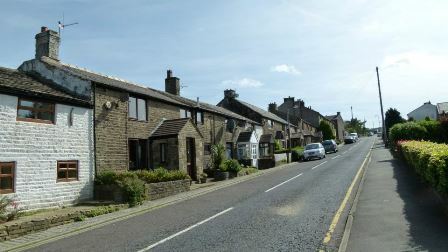 In the census of the same year her husband, John, is living at 14 Chapel Street, Belthorn, he is 58, a widower. It is through this census that we learn that John and Betty had 7 children, only one of whom is still alive. Betty's aunt Margaret is still living with the family, she is now 68. Also living with John is his 20 year old Annie who is now down as his adopted daughter; she was born in Carnaervonshire. 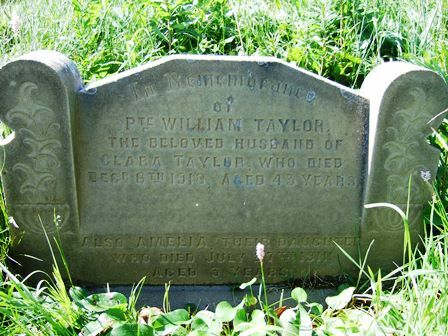 Betty and John's one remaining child, William, married Clara Taylor on 16th July 1898 at Immanuel Church. They have three children: Gladys 1902-1988, Eva b. 1904 and Amelia 1908-1911. In 1901 they are living at 12 Chapel Street; both William and his wife are cotton weavers. In 1911 the family are living still at 12 Chapel Street. William is 35 and Clara 37, they are both still cotton weavers, but they now have three children: Gladys 9, Eva 7 and Amelia 3. Amelia dies the same year, she is three years old. As if the family haven't suffered enough tragedies, William dies on 8th December 1918 just after the end of the first world war, and William is still in the army as the inscription on the family gravestone clearly identifies him as private (Pte); he is buried with his daughter, Amelia. 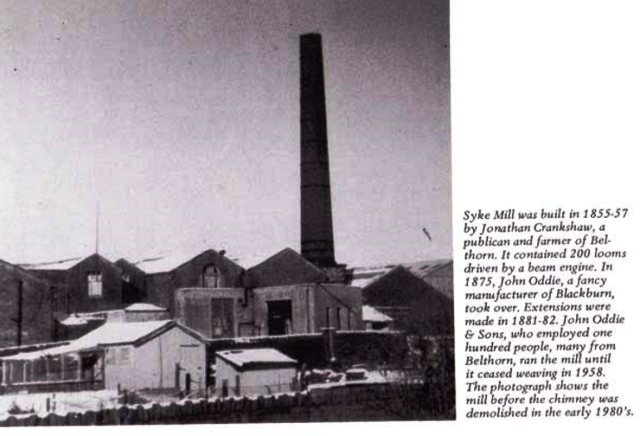 John Taylor, Betty's husband, dies on 18th February 1927, he is 75 years old and was still living at 14 Chapel Street. He has outlived his wife and all of his children. Clara, John's daughter-in-law, dies in 1934 at the age of 61 years. I don't know what happens to her daughter, Eva, but Gladys marries James Edward Smalley in December 1929 at Immanuel Church, Oswaldtwistle; she dies in 1988 aged 86. Nancy, Edmund and Ann's fourth child, you may recall was living with her parents at 45 Belthorn in 1871 and is a cotton power loom weaver. Nancy dies at the age of 25 years in 1877. In 1881 Mary, you may recall, is 27, single, and living with her parents Edmund and Ann in Belthorn; she is a cotton winder. Mary marries Isaac Taylor in 1885 at Immanuel, Oswaldtwistle. Isaac is a confectioner from Yate and Pickup Bank. They have one child, Maria, born in 1889; Mary dies giving birth to her daughter. She is buried on 12th March 1889 at Immanuel. Maria is baptised on March 3rd also at Immanuel. Isaac is down as being a collier. He dies three years later in 1892. I'm not 100% sure what happens to Maria, but in discussions with Andrew Bennett, it seems likely she was taken in by Isaac's brother, William Taylor and his wife Betty as their own daughter. A Maria Taylor of the same age can be found with William, Betty and their family in the 1891 and 1901 census' whilst in the 1911 census she is lodging with Richard and Betty Smalley. It could be these are relatives as a James Edward Smalley married married Gladys Taylor, Betty Barnes' grand-daughter. Maria marries George William Silverwood at Immanuel, Oswaldtwistle in June 1920; she doesn't appear to have had any children. Maria dies in December 1943 at the age of 54. Andrew marries Alice Ann Taylor on 24th August 1878. 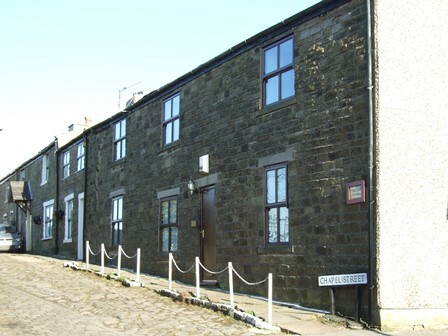 In 1881 Andrew and Alice are living at Kendal Row, Belthorn with their first child, Nancy who is 5 months old. By 1891 they are living at 14 Belthorn Road and Ned Row; Andrew is still a coal miner and Alice is still a cotton weaver. However, they now have four more children: James Edward 8; Rebecca 6; Annie 3; and Margaret 1. They are living next door to Andrew's mother, Ann, and his two sisters, Margaret and Alice. Nancy is now 20 and a cotton winder; James is 18 and works in the coal mine; Rebecca 16 and Annie 13 are both cotton weavers; Margaret is 11. There are now four new children: Mary Ellen 8, Ada 6, William 3, and Alice Taylor, 1. Their son, Richard Eccles, was born in 1901 but died the following year when he was 10 months old. 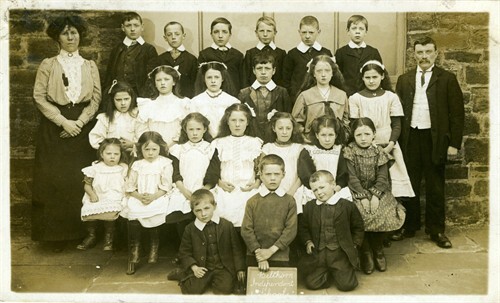 The family are still at 2 Chapel Street in 1911. Andrew and Alice Ann have been married for 33 years and of the 10 children they have had they have only lost one, which is quite a contrast to his sister, Betty's family. Thanks to Andrew filling out the census form wrong we have a lot more information about their children. Andrew dies five years later on 6th September 1916 at the age of 59; he is living in James Street at the time. Alice Ann dies three years later on 28th January 1919 at the age of 62, she is also living in James Street. 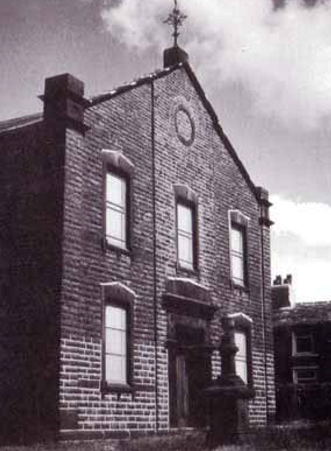 In 1906 Nancy marries John Hall at the United Reform church in Oswaldtwistle. However, John dies three years later and in 1911 Nancy is back living with her parents and siblings at 2 Chapel Street. James (1914-1989): James is born on 14th September 1914 at Belthorn Road, he is baptised at the Independent Chapel on 15th November. James marries Daisy Haworth in 1938 and they have two boys. He dies in December 1989. Albert (1916-1964): Albert as born on 23rd September 1916, also at Belthorn Road and is baptised at the Independent Chapel on 12th November. 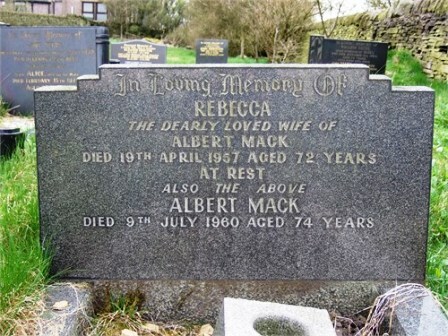 Albert dies in October 1954 at the age of 38.
she is baptised on 10th August at the Independent Chapel. In 1947 she marries Edward Aspin Pickup, she dies in December 1981 at 62. 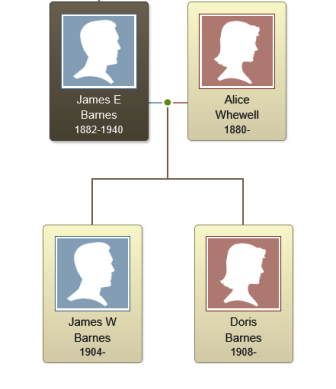 Their son, James William was born in 1904 and their daughter Doris in 1908. 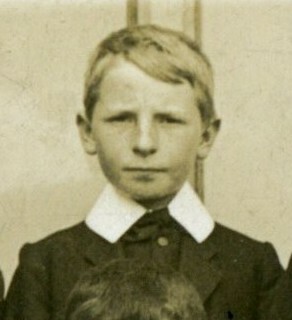 James Edward dies in March 1940 at the age of 57. 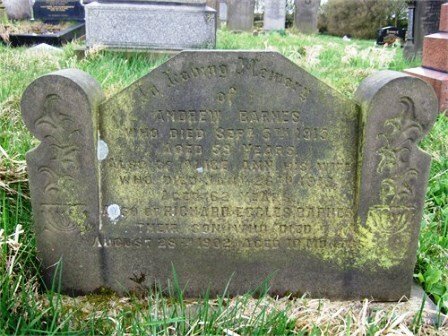 Annie Barnes (1887-1924): Annie is born on 6th July 1887 and baptised on 25th September. In 1901 she is thirteen and a cotton weaver living with her family at 2 Chapel Street. Seven years later and she gets married to Jesse Whalley at the United Reform church. They live just higher up the road at 8 Chapel Street. Annie and Jesse had one child, James, who had died. On 2nd September 1924 Annie dies, she is 37 and was still living in Chapel Street and is buried in the Independent chapel graveyard, grave number 13, third row. Jesse dies the following year. Margaret Barnes (1889-1945): Margaret was born on 5th July 1889 and baptised on 8th September. In 1911 she is 21, a cotton weaver like her sisters, and living with her parents and siblings at 2 Chapel Street. She doesn't get married until she is 34 in in 1923 when she marries Thomas Duckworth at the United Reford church, Westbury Gardens. 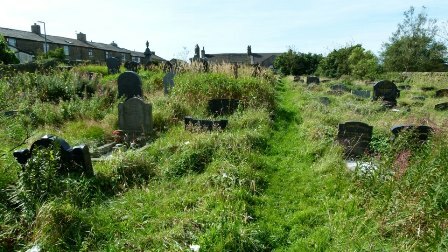 Margaret dies on 16th June 1945 aged 55 and was living at 111 Rockcliffe Street, Blackburn; she was buried on 20th June at the Independent Chapel, her grave is number 13, third row. Her husband, Thomas dies in 1949. Mary Ellen Barnes (1892-1974): Mary Ellen was 18 in 1911 and also a cotton weaver. She gets married in 1921 at the age of 29 to John Wood; they have a son. 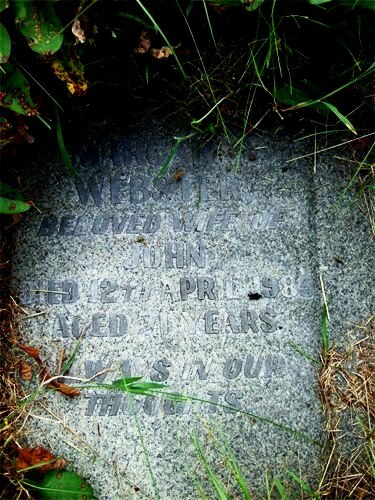 They have a long life together: John died in 1965, at Derby Cottage. Mary Ellen dies on 24 June 1974 at the age of 82 she was living at 123 Belthorn Road. They are buried together at the Independent Chapel, grave number 75, twelth row. William Barnes (1897-1978): Like his siblings, William is also a cotton weaver. Unlike his siblings, William doesn't get married. He lives a long life and dies at the age of 81 in December 1978. Alice dies in December 1980 at 80 years of age; John dies two years later. 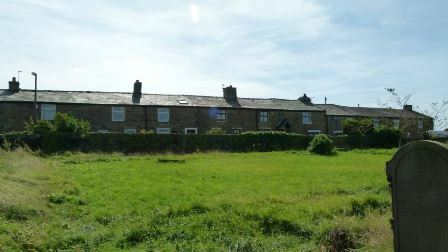 If you remember (and I certainly don't) in 1891 Alice is living with her mother, Ann and sister Margaret, with her brother Andrew and his family living next door in Ned Row. Alice is 32, single, and a cotton weaver. At the moment I do not have any more information about Alice.